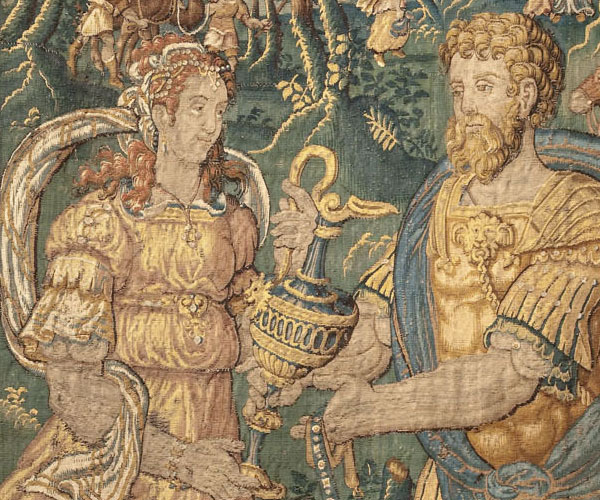 This series, the final one in Lleida’s collections, known as the Story of Abraham, consists of five tapestries. These five tapestries are “The vocation of Abraham”, “The Pharoah returns Sarah to Abraham”, “The separation of Abraham and Lot”, “Abraham sends Eliezer to find a wife for Isaac” and “Rebecca offers water to Eliezer”, all episodes told in the book of Genesis(12, 1-20, 13, 1-18, 24, 1-27). They reproduce models from Brussels, but were manufactured in the nearby city of Enghien. We know this because the coat of arms of Enghien is weaved into the border, along with the monogram “PVC” which refers to the workshops of Philippe van der Cammen. They are datedbetween 1560 and 1570. We can see that the characters in this series are depicted with anachronistic clothing and belongings in the Renaissance “Roman” style. The scenes of the life of Abraham are all set outdoors, a pretext for an intense depiction of landscapes with groves and fields featuring flowers and plants. 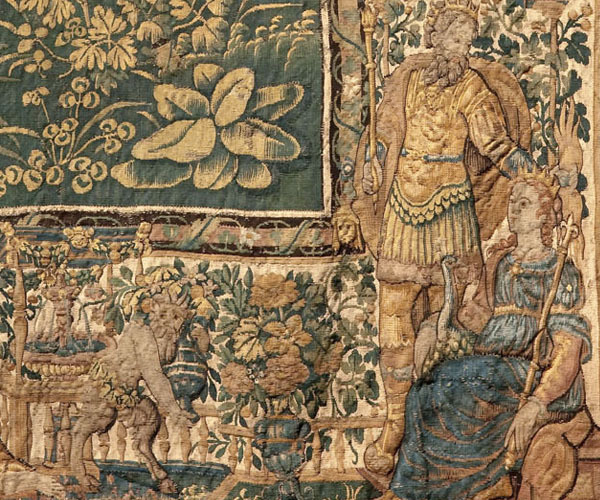 As is normal in Flemish tapestry designs from this period, the borders have become wide, compartmented bands which, on a floral background, contain depictions of figures and animals housed in aedigulae and pergolae. They are allegories and moral stories, covered with decorative elements related to figures from the typical Renaissance repertory, and originating from ancient times, such as the Physiologus, a Greek collection of moralized beast tales. These were in fashion at the time, following the diffusion of works such as Alciatus’ Emblemata. Characters depicted include Victory with her palm, Justice with her sword, Vulcan and Venus with Cupid, and Jupiter and Juno with the peacock. Furthermore, these borders feature moralizing inscriptions related to bestiaries. These include: a fox clutching a bird while another bird flies away (with the inscription sua et alienaulciscitur – “punishing others, one punishes oneself”); a lizard (lucisegens – “deprived of light”); a stork killing a snake (ne cuiquamnoceat – “lest it harm anyone”); a unicorn bending its head (durum alienavivereope – “it is difficult to rely on the help of a stranger”); and a goat standing on the milk it has itself produced (in desciscentes – “inconsistencies”). In the lower part of the border, we see Tellus – Mother Earth – depicted with the horn of plenty, and in the upper part we see an allegory of the Gate of Paradise. As pointed out by the scholar Guy Delmarcel, the weavers Léon van den Hecke and Philippe van der Cammen lost a series about the life of Abraham in Antwerp in 1576, when the city was sacked by mutinous Spanish soldiers. It may be suggested, therefore, that the tapestries from Lleida are this exact series. As for the incorporation of this series into the Cathedral of Lleida, it is most likely that the Story of Abraham series was a donation by the Bishop of Lleida and Archbishop of Tarragona, AntoniAgustín, who was in Lleida from 1561 until 1576, given the chronology of the series and the fact that we know they were in Lleida in 1588. This cleric’s refined culture and city travels – including a stay in Brussels – further support this hypothesis. Furthermore, we know that tapestries featured among the possessions auctioned after his death, nine of which were acquired by Archbishop Terés, his successor at Tarragona Cathedral.